As you may already be aware, on 17 October Microsoft released the Windows 10 Fall Creators Update. This release is similar to installing a new operating system, because it will change configurations and encryption keys. The MetaTrader platform binds all data to the local operating system and hardware in order to protect user information. 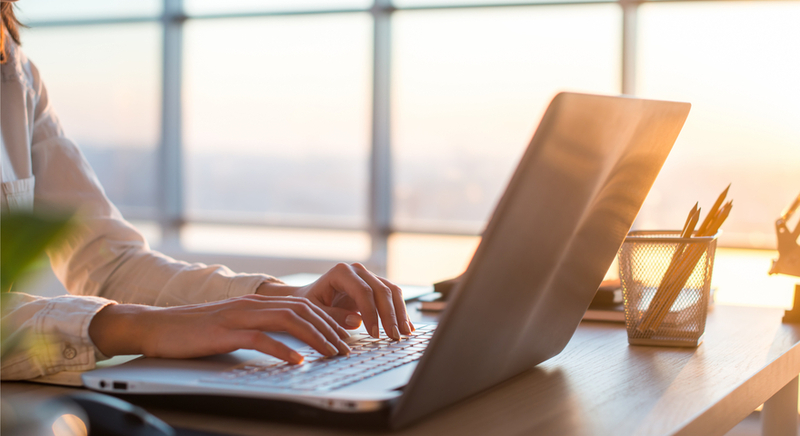 This binding means that even if the terminal files are stolen, no one will be able to connect to the server using previously saved accounts. We highly recommend that you prepare for this new Windows release and save your passwords in a safe place in order to be able to access the platform after the update. 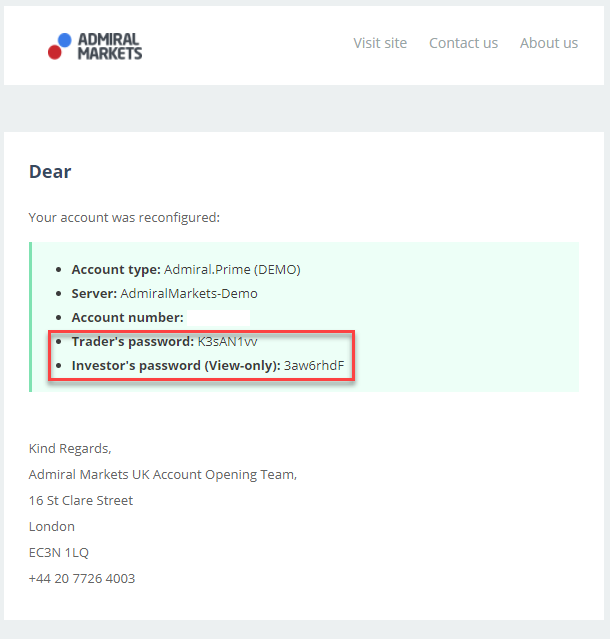 Unfortunately, once you update the operating system, all passwords for trading accounts stored on your computer will become invalid. Due to the change of encryption keys, one activation token for applications purchased from the MetaTrader Market will be lost, because all products are bound to the operating system. Because of this, MetaQuotes has automatically added one activation token for each purchased product, regardless of the operating system it's used with. Traders can also re-download demo versions of products from the market. 1. 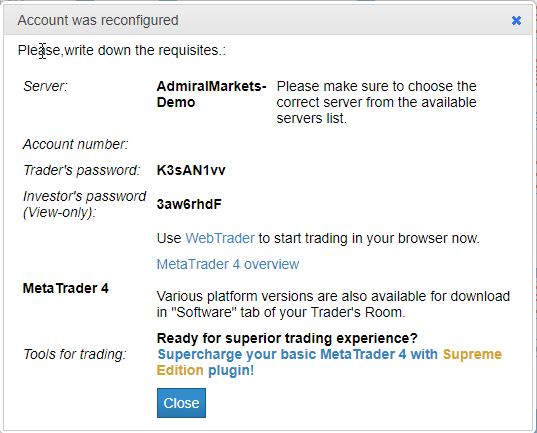 Select the necessary account in your Trader's Room. 2. 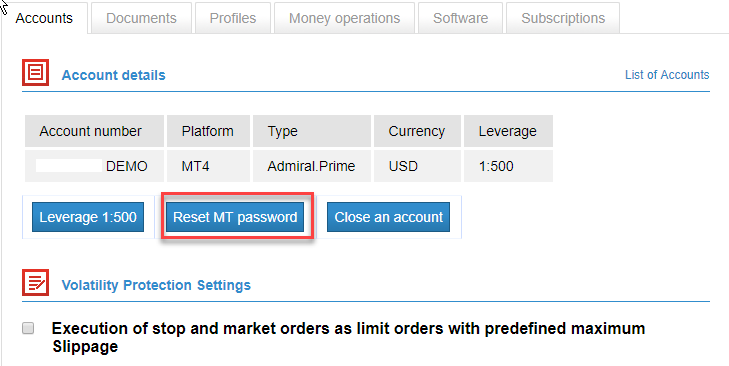 Click the Reset MT password button. 5. Click the Confirm MT password reset link inside the email. 6. You'll then see a confirmation message, confirming your password change. 7. 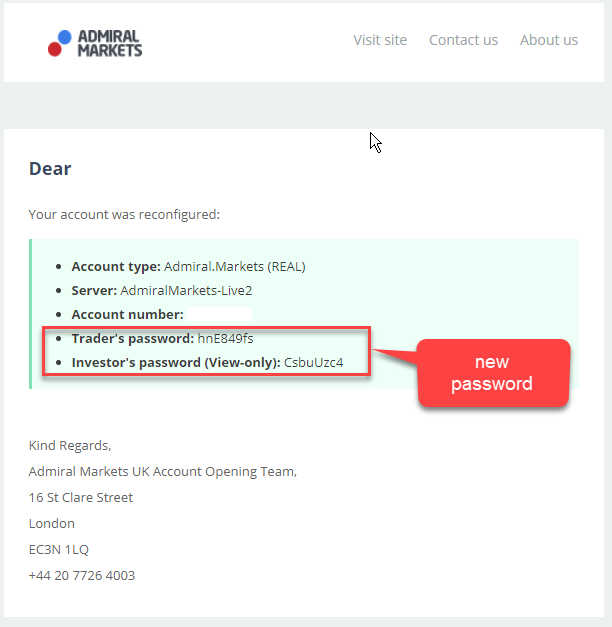 Finally, you'll receive an email with the subject line : Admiral Markets MT Password Change Notice, which will contain your new password. We apologise for any inconvenience that this may cause. If you have any questions about this or any other aspect of our services, please don't hesitate to contact your customer support team or your personal client manager.